AR-15 M-LOK Lightweight Frame Rail System 10"
Home > Handguards > AR-15 M-LOK Lightweight Frame Rail System 10"
Material: Aircraft grade 6061-T6 aluminum. Internal diameter: 1.39” width 1.67 height. Only 10” M-LOK location: 5 M-LOK sections of 1.26” at3, 6, 9, 12 o’clock location has only 2 M-LOK sections. Only 10” Top rail has 7 slots or (2.9”) section of pica-tinny on the beginning and 6 or (2.45”)slots at the end of rail, the rest of the rail is skeleton cut with 2 M-LOK section for perfect customization. Finish: Black Hard-coat type III Anodized. 6 screw fasteners design with proprietary screw for easy installation. Spanner wrench needed to torque barrel nut to spec (not included) and hex wrench. All Rail Sizes do come with two 3 slots M-LOK or (1.58”). Also included is two washer if needed for timing on all rail sizes. 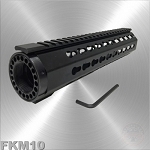 10” : M-LOK location: 5 M-LOK sections of 1.26” at3, 6, 9, 12 o’clock location has only 2 M-LOK sections/ Top rail has 7 slots or (2.9”) section of pica-tinny on the beginning and 6 or (2.45”)slots at the end of rail, the rest of the rail is skeleton cut with 2 M-LOK section for perfect customization.